Buffet breakfast at hotel. Full day city excursion to Tiananmen Square-the largest square in the world, Forbidden City-imperial palace of Ming and Qing Dynasty, and Temple of Heaven-here ancient emperors prayed for good harvest. Lunch at good local Peking Roasted Duck restaurants. 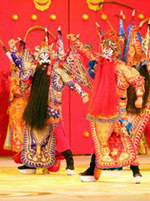 You can choose the Peking Opera Show (or Chinese Kungfu show) as optional in the evening. The Tian’anmen Square: The largest city square in the world. The Temple of Heaven: The Temple of Heaven is a masterpiece of architecture and landscape design which simply and graphically illustrates a cosmogony of great importance for the evolution of one of the world’s great civilizations. Buffet breakfast at hotel followed by full day trip to the Great Wall at Badaling, the Ming Tombs and the Sacred Way with lunch at local Chinese restaurant. The Ming Tombs: Consisting of mausoleums of 13 Ming emperors, is one of the largest imperial necropolises in China. Buffet breakfast at hotel, then transfer to the airport for flight to Jiuzhaigou, meet and transfer for sightseeing in Huanglong Scenic Area. Huanglong Scenic Area: It is a state first-class scenic zone, reputed as "Jasper Lake on Earth". The scenic area was made a world natural heritage site in 1992. 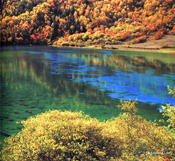 Full day sightseeing in Jiuzhaigou(World Heritage Area). Jiuzhaigou: Famous for its blue lakes, rushing waterfalls and its deep green trees, the National Park is a wonderland for trippers. Buffet breakfast at hotel, then transfer to the airport for flight to Chengdu. Upon arrival, meet at the airport and transfer to stroll in the Culture Park and sip tea at teahouse in People's Park. 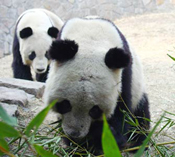 Panda Base: In the Panda Base,people can get approached to the pandas and take closely look of the cute animals. Wuhou Memorial Temple: It was built in memory of ZhugeLiang, prime minister of the Shuhan State during the Three states Period in the third century (220-280). In the temple are forty-seven statues of Shuhan civil and military officials as well as steles, stone tablets, tripods, stoves and other relics. Buffet breakfast at hotel, transfer to the railway station to catch the trian to Chongqing. In the evening board your deluxe cruise ship for the Three Gorges river journey. Depart Chongqing 8:00am. Shore excursion at Fengdu or Shibaozhai. Fengdu: known as the "Ghost City" and is a place for punishing the devil and awarding the good. ShibaoZhai (Stone Treasure Stockade): It is a towering wood red pavilion 12-storey high was built against a protruding 220-meter rectangular rock with sheer cliffs on the north bank of Yangtzi River. Pass through the magnificent Qutang Gorge and beautiful Wu Gorge. Transfer to a small sampan to cruise the Shennong Stream. Qutang Gorge: the first of the three gorges of the Yangtze River, and the one that is famous for its sheer and spectacular precipices. Wu Gorge: the most beautiful section of the Yangtze River, The gorge was also known to be as dangerous as it is beautiful. Shennong Stream: a tributary of the Yangtze River, a sampan tour in Shennong Stream will allow you to experience a high speed adventure. Visit the Three Gorges Dam. Arrives in Yichang. Be transferred to the airport for your flight to Shanghai. Upon arrival meet and transfer to Hotel. Three Gorges Dam: the largest water conservancy project ever under taken by human being is now being built at Sandouping in the middle of Xiling Gorge. Xinling Gorge: the longest part of the Three Gorges. Buffet breakfast at hotel. Full day city tour with visit to the Yu Garden, the Jade Buddha Temple, the Bund and Nanjing Road with lunch at local Chinese restaurant. 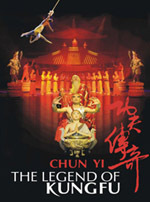 You can choose the Acrobatic Show as optional in the evening. Yu Garden: a place of peace and comfort in the heart of bustling Shanghai, dates back to the fabled Ming Dynasty. The Jade Buddha Temple: The most famous Buddhist temple in Shanghai. The Bund: known as a miniature museum of international architecture with dozens of high buildings standing along the shore. Nanjing Road: the longest commercial street in China, lined with big department and specialty stores, upscale boutiques, and a variety of fine restaurants, enjoying the reputation of "China’s No.1 Street". Gratuities, Tips to guides or drivers. Optional Full Day Suzhou Tour. Buffet breakfast at hotel. Full day trip by coach or train to Suzhou where you will visit Garden of the Master of the Nets, Lingering Garden and Silk Factory with lunch at good local restaurants. Afternoon, boat trip on the ancient canal in Suzhou. Back to Shanghai in the evening. Garden of the Master of the Nets: Suzhou is famous for its the Gardens. Garden of the Master of the Nets is an elaborate succession of small gardens. In the garden you would marvel at this unique architecture art. Lingering Garden: It is the best preserved among all the Suzhou gardens. Silk Factory: Suzhou is also famous for its silk production. In the factory you can see how the silk is processed from the silk worm to the final woven cloth. Ancient Canal:which is 1,764 km (about 1200 miles) in length, is the longest man-made waterway as well as being the greatest in ancient China. Prices are valid until December, 2019 and prices are not available in major holiday (October 1- October 7, Feb 4- Feb 10) in China.